Is the economy hurting regular people? You betcha. 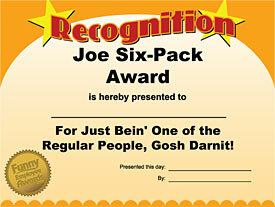 So while Wall Street is collapsing, have some FREE laughs on Main Street courtesy of this funny certificate: The Joe Six Pack Award - for just bein' one of the regular people, gosh darnit! Post your ideas for awards in the comments section below!